Since the Rocket Glider project was released in MAKE Volume 31 (makezine.com/go/rocketglider), it’s been wildly popular. But one struggle that younger builders have is getting the glider pulled back on the handheld catapult. With this portable and inexpensive launcher, even the youngest kids can achieve impressive flights. 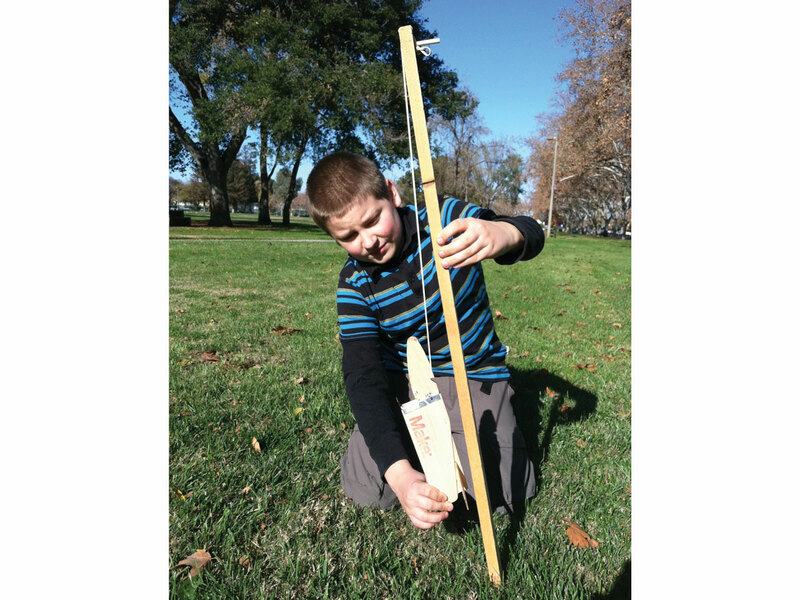 Rocket Glider Maker Shed #MKRS2, or other catapult-launched flying object. 1. Cut a stake and drill a hole. 2. Secure the rubber band. 3. Pound stake into the ground. Step #1: Cut a stake and drill a hole. Make 2 angled cuts in the pine board to form a point on one end, then drill a 1/4" hole centered on the opposite end. Step #2: Secure the rubber band. Feed the dowel through the hole so that one side is flush with the stake and the other protrudes. Next, put the rubber band around the dowel, then staple the rubber band to the wood to keep it in place. Step #3: Pound stake into the ground. Place the stake dowel-side up with a slight angle. Use a piece of scrap wood to protect the top when you hammer it into place. Hang the loose end of the rubber band over the top of the stake. Hook the notch on the bottom of the glider onto the rubber band, pull the plane down along the length of the stake, make sure your face is clearly out of the way, and let it rip! Be sure to launch along the stake, not toward it, or you may break the plane. If wind is a factor, make sure you're launching on the downwind side. With this much stretch, the rubber bands tend to wear out quickly. Keep a supply on hand for quick replacement. Rick teaches middle school in San Jose, CA. He’s a contributing writer for MAKE and leads after school making clubs with kids. He designed the compressed air rocket for MAKE 15 and the folding-wing glider in MAKE 31. With his wife and kids, Rick loves all things that fly. Rick is the co-founder of AirRocketWorks.com.